Crostini: Crostini or Crostino is an Italian appetizer consisting of a small slice of grilled or toasted bread and toppings. The toppings may include a variety of different cheeses, meats, and vegetables, or may be presented more simply with a brush of olive oil and herbs or a sauce. Crostini are typically made using Italian ciabattas and are often served with wine. Slice the ciabatta bread of about ½ inch thick slices. Brush the bread on both sides with the olive oil. Season the bread slices lightly with salt and pepper. Bake until crusty and brown, about 10 to 12 minutes. Turn once about halfway through cooking, and dust with Parmesan. 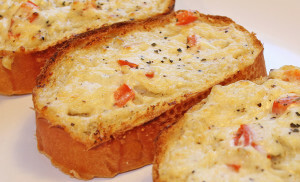 Serve Crostini hot, warm, or at room temperature.